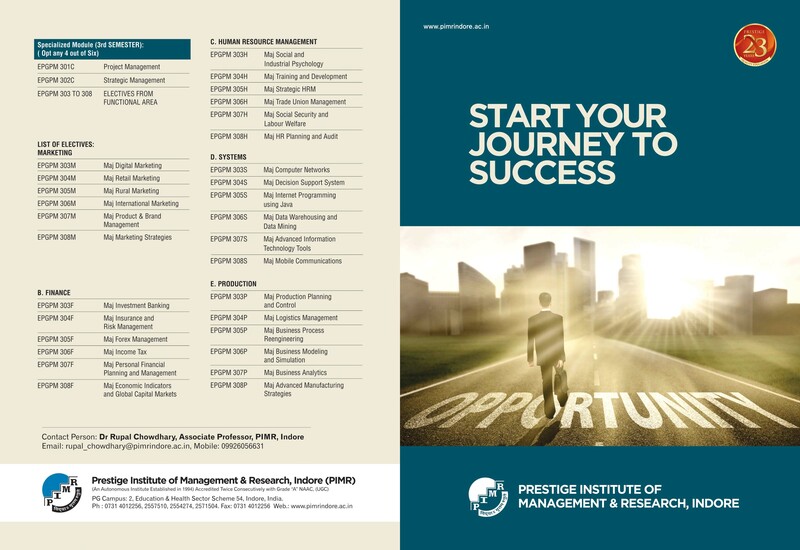 The Prestige Institute of Management and Research, Indore is a well established premier management Institute of Madhya Pradesh which enjoys autonomous status twice consequtively by UGC since 2006 and again in 2012. It is recognized by University Grants Commission under 2(f) and 12 (b). Its MBA program has been accredited by National Board of Accreditation under AICTE since 2003. The Institute has also been accredited twice by National Assessment and Accreditation Centre (NAAC) and has received twice NAAC ‘A’ Grade Accreditation. It is an ISO 9001:2008 certified Institute. PIMR has also been consistently ranked amongst number 1 B-schools in Central India by various leading rating agencies. The Institute is therefore a premier B-School providing quality education in the field of management. The Institute is also recognized research centre since 1996 and currently has 23 Ph.D. guides and 109 research scholars registered with it as a research centre for Ph.D. program. Till date 61 research scholars of PIMR have been awarded Ph.D. degree. The Institute has been regularly hosting national and international conferences which have seen the participation of delegates from various countries such as USA, China, Brazil, Romania, Czech Republic, Nigeria, Thailand, Bangladesh, Russia, Libya, Tunisia, Algeria to name a few. Apart from this the institute regularly hosts Research Methodology workshop every year. Till now the institute has hosted thirteen Research Methodology workshops. In the line of its academic endeavor the institute is starting its Executive post Graduate Program in Management for working professionals for further adding their skills. The classes would be conducted on weekends that is Saturday Evening and Sunday. 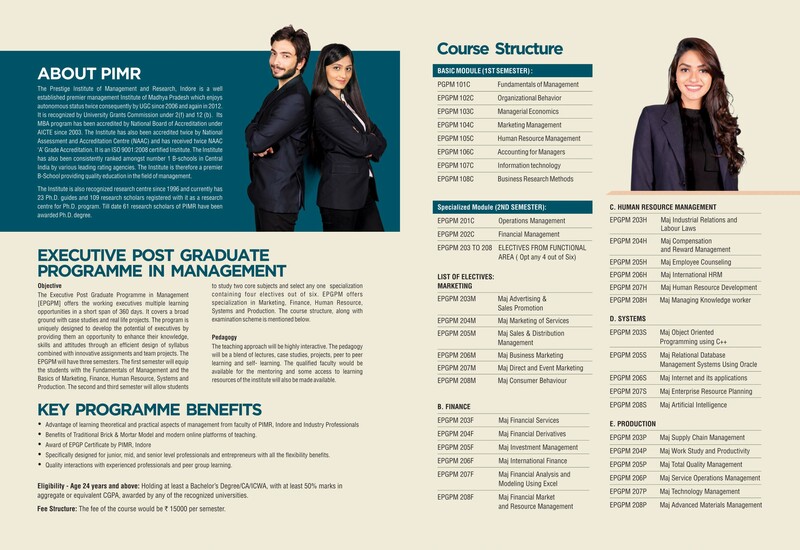 The program benefits, course and fee structure is given in the brochure.